While it’s rare to make tomato paste today, when there are thousands of store-bought varieties available, like nearly everything, it tastes better if made from scratch with fresh ingredients. I’ve never made or tried homemade tomato paste, although I read a recipe for tomato ketchup in a Kansas cookbook and have been meaning to try it out. 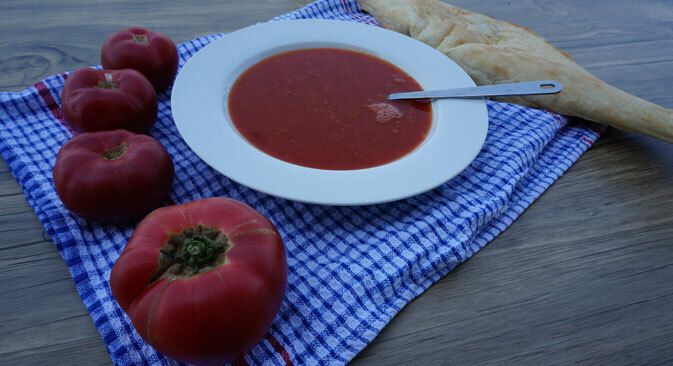 I was pleased to find a recipe for tomato paste in the Soviet cookbook, as timing couldn’t be better: it’s summer and I’m in Georgia — the land of incredible tomatoes. Tomatoes are the first thing my husband and I give those who make the trek to Tbilisi to visit us to try, and everyone agrees that the explosion of flavor that happens in your mouth makes you want to empty your suitcase and stuff it entirely with tomatoes to bring home. I am trying to figure out how to bring ripe tomatoes over to Moscow so granny can taste them. In Moscow the recipe from the Book simply wouldn’t work today — if you find a beautiful ripe tomato, you’ll just eat it fresh instead of trying to stew it. You also know that there will still be imported tomatoes in winter, so the need to preserve summer ones is not very high. In Moscow, you are guaranteed to get bad tomatoes throughout the year. Speaking to my grandmother I was surprised to discover that things used to be much better with regard to tomatoes! It suddenly dawned on me that moving to Georgia took me back to the “good old days” when seasonal vegetables were abundant, delicious and cheap. The perfect occasion to make tomato paste, although I have a feeling as soon as I get hold of some Italian pasta it won’t have the chance to survive until winter — it turned out delicious! Select the ripest tomatoes, wash, cut in half, put into a heavy saucepan and put on the stove over low heat, stirring occasionally until a thick mass forms. Stir well, and let the mass boil down, but stir so the mass does not become thick. Add salt, cool, and store in a jar. Once in the jar, cover the mass with a thin layer of oil. Cover the lid with parchment paper and tie off.